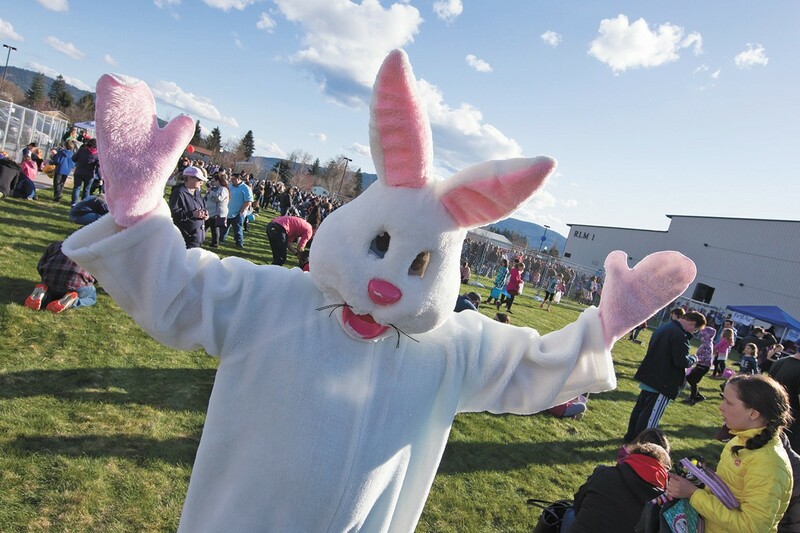 Set your clocks for 10 am on Saturday, March 31, for the annual EASTER EGG HUNT at McEuen Park sponsored by two local churches for children up to 5th grade. For hunters with keen night vision (or a good flashlight), check out the all-ages FLASHLIGHT EGG HUNT from 8-9 pm at Community United Methodist Church’s. Call 208-765-8800; cdaumc.org. While everyone is still dressed in their Sunday best, get a PHOTO WITH THE EASTER BUNNY at the Silver Lake Mall, from Wednesday, March 28, through Saturday, March 31, from noon-4 pm and 6-7 pm. Prices starting from $25. Call 208-762-2113; silverlakemall.com. Hunting Easter eggs and posing for photos is hungry business and fortunately, the COEUR D’ALENE RESORT offers two brunch options for Easter Sunday diners: BEVERLY’S, from 9 am-3 pm ($47 adults, $24 ages 5-12) and DOCKSIDE, from 8 am-4 pm ($59.95 adults, $30.95 ages 5-12). Both menus feature roast meats and all the fixings, breakfast dishes, fruit and the Resort’s renowned desserts. Call 208-765-4000; cdaresort.com for details, reservations. Have your brekkie on the water with an hour-and-a-half EASTER BRUNCH LAKE CRUISE departing at 11:30 am and noon. Tickets $50.75 adults; $46.75 ages 55-and-over; $30.75 ages 6-12. Call 855-703-4648; cdaresort.com/discover/activities/events. BISTRO ON SPRUCE is serving brunch from 9 am-2 pm with dishes like eggs benedict and asparagus salad. $27 adults; $15 ages 6-12. Call 208-664-1774; bistroonspruce.com. And in Post Falls, HOTEL RED LION TEMPLINS ON THE RIVER offers a gorgeous riverside view for your Sunday brunch from 10 am to 1:30 pm. $28.95 adults, $25.95 ages 55-and-older, $14.95 ages 12 and under. Call 208.773.1611; www.redlion.com/templins/dining/mallards-restaurant. Pile in the car and take a “Sunday drive” to Worley, where the COEUR D’ALENE CASINO AND RESORT HOTEL is hosting the biggest brunch you can imagine at the High Mountain Buffet from 7 am to 2 pm with no reservations required ($19.99 adults, 12-and-under half price). Or time your arrival for dinner — lamb, roasted salmon, smoked ham — from 4-8 pm ($24.99 adults, 12-and-under half price). Call 800-523-2464; cdacasino.com for details. And for a weekend adventure, check out SILVER MOUNTAIN’S SPRING CARNIVAL Saturday, March 31. Spring Break kicks off at 11 am with a BBQ, toboggan relay and more. Play and stay, because Sunday means brunch at Noah’s, and two Easter egg hunts: one on the mountain and one at Silver Rapids. Call 866.344.2675; silvermt.com/Things-To-Do/Event-Calendar. Support Vanessa Beehan Crisis Nursery, while enjoying all Triple Play has to offer, from bumper cars, a ropes course, bowling, and laser tag to Raptor Reef Indoor Waterpark. For every ticket sold, Triple Play will donate 50 percent to Vanessa Beehan Crisis Nursery. Tickets $16; 6-9 pm; Triple Play Family Fun Park; visit 3play.com/specials-and-events for details. A sure sign that spring has arrived — The Coeur d’Alene Golf Course and its impeccably manicured greens opens back up on April 5. To book your tee time, which includes the world-famous floating green, visit golfcda.com or call 800-935-6283. There’s so much to eat, and so little time, so make the most of the first annual Food & Wine Festival at the Coeur d’Alene Resort. The weekend features tasting seminars, cooking classes, intimate luncheons and two unforgettable chef dinners. Tickets $35-$249; visit cdafoodandwinefest.com for a complete event schedule and locations.